Cross and Cutlass: Friday Frenzy! Yay Medieval! and Paradise Giveaway! Friday Frenzy! Yay Medieval! and Paradise Giveaway! Last week I posted a short survey asking the question what you all preferred that I write next. I thought you might be interested in the results. For those of you who did not choose Medieval, don't worry. I am planning on writing more pirates novels in the future, along with a host of other ideas. THANK you all so much for voting!!! I value your opinions! Leave a review on one of my other books that you've read on Amazon. (Tell me what book and your handle) If you have left reviews on all my books, tell me that in your comment. If you enjoyed the series, promise to tell one other person about it, someone who you think would benefit from the spiritual themes. Leave a comment listing that you have done the above, along with your email, and I will have Random.org choose 6 winners. I will check each winner's comments (along with my newsletter and email subscribers and reviews) to make sure they have done the above. If not, I will have Random.org choose another. WINNERS will be announced on the 22nd! Leaving on May 12th and returning on May 21st. I'm visiting my Mom and sister. And guess who else I'm seeing??? For those of you who know her and her writing, you're going to be jealous! Julie Lessman!! We rented a small cabin just for a day, along with a lovely lady who I have never met before, but someone who I feel like I've known forever, Bonnie Roof! Yeahhhhhhhhhhhhhh .... to the "medieval/or/viking" books !!!!!!!!!!!!!!!!!! Love it, love it, love it ! Wishing you safe travels and fun times in Tennessee ... visiting with your Mom. And, for the day with Julie Lessman and Bonnie Roof. Enjoy your "R & R" !!! Come on down, it's warmer down here, Melony! WHAT!?! I live in Tennessee...how exciting to have two of my favorite writers in my neck of the woods! We're in a hot spell right now, so dress lightly. Hope you have a great time and am SUPER excited about you writing a medieval series - especially since it got my vote. Wasn't sure if I could be part of the contest since I already receive your newsletter and follow your blog. Thanks Amy!! I love Tenn! Sure, you can enter the contest! Since you're already on my blog and newsletter, all you need to do is promise to write a review on the book..
YEAH! Please sign me up for the contest then. I do promise to leave a review about the trilogy. I have left a comment via Amazon about 'The Ransom' under my name (Amy). I've already told others about your book, but will happily continue to do so . I have only read a couple medieval themed books and enjoyed them more than I thought I would. I am sure your medieval book will be as fantastic as your others are. Tennessee, I am so jealous! Julie Lesson and Bonnie too, would love to tag along. Enjoy your visits and refresh yourself. Happy Mother's Day to you and your mom. 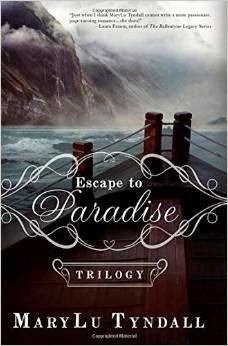 Since I already have the Escape to Paradise series, I am not entering the contest. -I Promise to leave a review on Amazon and Barnes and Noble of the trilogy. - I have previously signed up to follow your blog via EMAIL. -I will happily leave a review on one of your other books that I've read on Amazon (as soon as I read one), as well as review it and the series in this giveaway on my blog (http://singinglibrarianbooks.weebly.com/). -I have previously signed up for your newsletter. -I am sure I will looove the seires and I promose to tell at least one person (probably more via my blog) that I enjoyed them. I will leave a review on Amazon and B&N. I follow your blog via email and signed up for your newsletter. I've not read any of your books. Escape to Paradise Trilogy sounds amazing. Enjoy your time with the LOVELY JULIE LESSMAN and AWESOME BONNIE ROOF. No need to enter me, since I have the series. Have a great weekend, MaryLu! I would LOVE to receive a copy of this series to give away as a gift (since I own them already)--I want to introduce others to your incredible writing! I reviewed the trilogy on 3 sites: Amazon, B&N, and CBD. My pen name is "LD" on Amazon, "LD2" on B&N and CBD. I also reviewed these other books: Tears of the Sea, Forsaken Dreams, Elusive Hope, Abandoned Memories, and Veil of Pearls on Amazon, Barnes & Noble, Christianbook.com, (INSPYs, Grace Awards, PUYB, various other sites). I've already signed up to follow your blog via email and to receive your newsletter. Thank you all !!! Hugs! Hi! Hope you have a great trip. I just stumbled across you in the last year or so and you have quickly become one of my favorite authors. I signed up for your newsletter and blog updates and left a review on Amazon under my name, Elizabeth Herrera. My email is irishharpist@yahoo.com. And of course, if I end up with the books I will leave reviews. I already tell people you are one of the best so of course I will keep spreading the word! YAY!! Another beautiful book - no matter the subject, time, or setting, it will be wonderful!! But first, the exciting "The Reckoning"!! I have the "Escape to Paradise" series - but would love to win the series for a good friend, who is an avid reader, unemployed, and with many serious health issues. She became a MaryLu fan after I gifted her 7 of your books last Christmas. I would also like to put it in my church library - I have already promised to provide them with some of your other books. Have completed the required above - one of my Amazon reviews is for "Tears of the Sea", under my name; will be glad to write a review for the trilogy. Can't wait to meet you, one of my very fave authors and a sweet, godly online friend - you and your writing are such an inspiration to me!! Hopefully, I will meet you one day, also, Angi (as well as Tina, Caryl, and other sweet online friends) - looking forward to reading a book written by you. Visions of wonderful girl-times!! Love, hugs, and prayers, MaryLu!! I follow your blog via EMAIL . I love all the ships. Beautiful ! ! I've already signed up for newsletter & blog & follow..